The Congregation for Oriental Churches informs that the Prefect, Cardinal Leonardo Sandri, will be in Ukraine from the 11th to the 17th of July 2017 upon invitation of the Major Archbishop of Kyiv-Halyč, H.B.Sviatoslav Shevchuk, and on the occasion of the national Pilgrimage to the Shrine of Zarvanytsia. Cardinal Sandri, accompanied by the Apostolic Nuncio H.E. Claudio Gugerotti, and by H.B. Sviatoslav Shevchuk will start the visit form Kyiv, the capital City, where in the afternoon of Tuesday 11th July he will pray in silence in front of the Cross in Maidan Square, where he will make a floral offering at the feet of the Cross. He will then proceed to the Museum of the Holodomor where he will make a symbolic gesture in memory of the victims. Int the morning of Wednesday 12th July, the Solemnity of Saints Peter and Paul according to the Giulian Calendar, he will participate in the Divine Pontifical Liturgy in the Cathedral of the Resurrection during which he will preach the homily and at the end of the Liturgy he will descend to the crypt to pray at the tomb of H.B. Cardinal Husar, who died on the 31st of May this year. In the afternoon, a meeting with seminarians at Knaizhychi is planned before leaving for Kharkiv, in central-eastern Ukraine, where he will visit the local ‘Caritas’. On Thursday 13th July in the morning, he will take part in the Divine Liturgy at the Cathedral of the Exharkate of Kharkiv, during which the underground chapel will be consecrated and the crosses of the dome will be blessed. Then he will have lunch with the priests and other guests. A meeting with the Bishop of the Ukrainian Orthodox Church was requested. In the afternoon, the delegation will travel about 200 km to Kramatorsk, where Friday morning, at the end of the daily Liturgy at the parish of Saint Elijah, the delegation will have a meeting with the Bishop and the priests of the Exharkate of Donetsk and of the region, and will visit the local Caritas and the community centre “Bdzhilka”. In the afternoon, before returning to Kharkiv, the Cardinal will stop at Sloviansk to visit the parish and the community centre. Here he will visit those who are internally displaced because of the armed conflict which started in 2014 and has destroyed considerable parts of the. city. Saturday 15th July, after reaching by plane Ivano-Frankivsk, His Eminence will meet the Greek-Catholic Metropolitan Bishop Volodymr Viytyshyn, and there he will join the annual pilgrimage of the Greek-Catholic faithful to the national Marian shrine of Zarvanytsia, in the Metropolitan See of Ternopil-Zboriv, headed by Archbishop Vasylij Semeniuk. The most significant moments will be the meeting with the young people on the evening of Saturday 15th July, the reflection which he will give to the pilgrims at the end of the procession with the candles and the Moleben on the night between Saturday and Sunday, and the homily during the Divine Liturgy on Sunday 16th July. In the late afternoon of Sunday he will reach Lviv, where he will visit the Greek-Catholic Cathedral of Saint George and pray on the tombs of the Metropolitan Bishop Andrey Sheptytsky and of Cardinal Joseph Slipyj, heads and fathers of the Ukrainian Greek-Catholic Church for a significant part of the twentieth century. 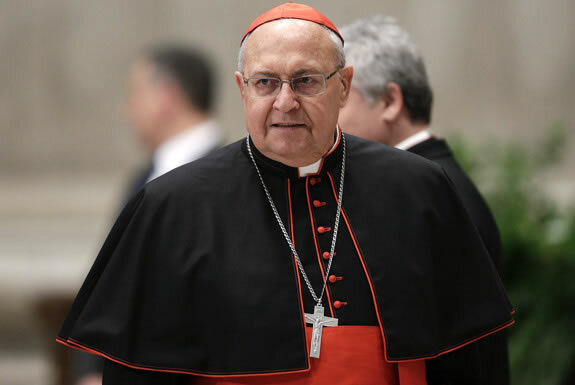 Monday 17th July Cardinal Sandri will return to Rome and, on the way to the airport, he will stop for a short visit to the Roman-Catholic Archbishop of Lviv. Also in Kyiv and in Kharkiv, in the previous days, a visit to the respective Roman-Catholic bishops is expected. Today the Holy Father Francis asked Cardinal Sandri to convey to all the catholic faithful, both Greek-Catholic and Roman-Catholic, but also to all the Orthodox brothers and sisters, and to all men and women of good will, his personal greetings and his blessings, with a renewed gesture of affection and closeness to the population for the sufferings and deprivations they have and are enduring during the well known conflict, adding his encouragement to all those working for peace, for reconciliation in accordance with the law, and for those who are engaged in works of charity and solidarity, aimed at aiding the many people displaced and destitute. The national pilgrimage to the Shrine of the Virgin Mary in Zarvanytsia will be an occasion to entrust to Her intercession the intentions of the Holy Father, and to pray and offer gestures of personal and communitarian conversion.